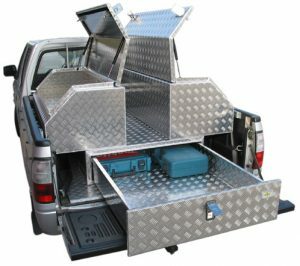 Ute Safe specialises in custom built aluminium ute toolboxes and storage compartments to suit tub and tray work vehicles, recreational, camping, 4WD and boating. Over the last 18 years, Ute Safe has created the largest range of aluminium toolboxes and continues to create new customised storage compartments to meet every conceivable use. Ute Safe boxes are manufactured in Victoria and shipped Australia wide. Best of all, Ute Safe sells directly to the public. Boxes of every shape are made to suit ute’s, trucks and trailers. Ute Safe has the camping box for your fridge and the canopy for your roof-top tent. Ute Safe keeps your tools and gear safe and sound with fully adjustable shelves and drawers. For work or recreation, from tubs to tray, work vehicles, recreational, camping, 4WD and boating requirements, from the smallest utility box to the largest canopy, Ute Safe has you covered. Our design ensures you get the long lasting box that works harder, looks after your gear, and provides genuine peace of mind. Ute Safe aluminium toolboxes are weather resistant and lightweight. Safeguard your equipment and items with high quality 2.5mm marine grade aluminium tread plate to protect against every condition. All boxes are fully T.I.G welded with door seals, and concealed hinges ensuring durability and strength. Our high standard is extended to every box. We select the same material and use the same work process for all aluminium toolboxes, standard or custom made. Backed up with a Ute Safe ‘321 Warranty’. 3 years on workmanship, 2 years on gas struts, 1 year on all other hardware – Your peace of mind is assured. These lightweight, durable, and cost effective storage boxes are available for delivery throughout Australia and can be purchased online via The Toolbox Company.